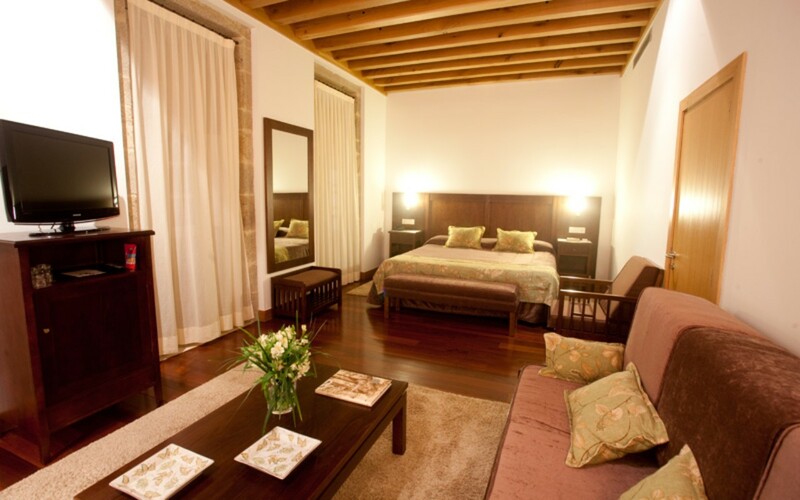 One of the best spots to stay in Santiago just a short walk to the Cathedral and easily accessible. 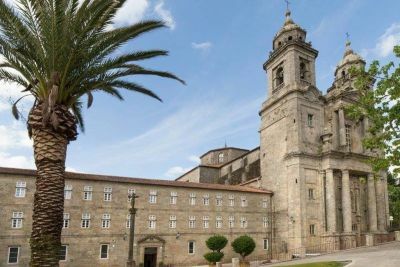 The hotel is housed in the Convent of San Francisco, which dates back to the year 1214, and located in Santiago de Compostela’s historic city centre, only 150 metres from the Cathedral. The 18th-century building, declared a Historic Building by UNESCO and opened to the public in 2005 after being refurbished, is a perfect combination of original architectural elements and contemporary materials and styles, giving rise to a unique hotel in the city that features functionality, design and history. While preserving its original Franciscan style, the hotel offers all the necessary facilities and comforts for enjoying a pleasant stay in an atmosphere that conveys tranquillity and peacefulness. 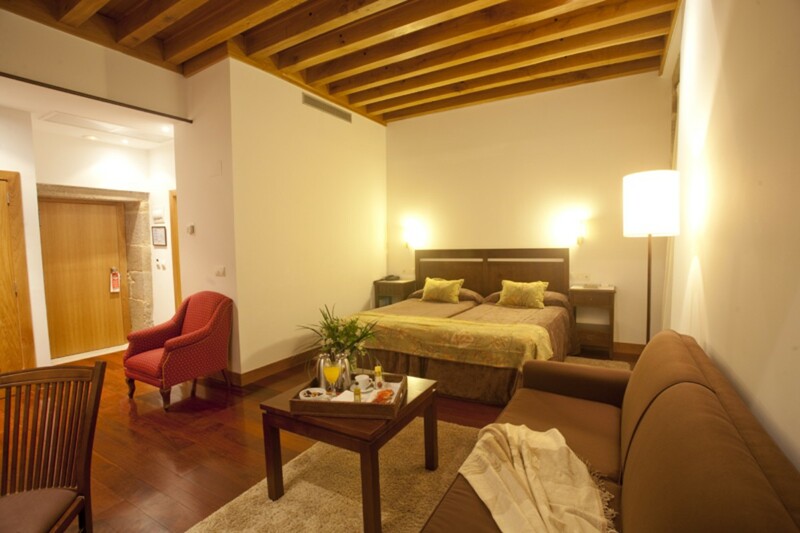 The modernity, elegance and design of San Francisco Hotel Monumento patents in its 82 rooms, where merge the tranquillity and the rest of an ancient convent, with the confort of a modern hotel. Our double rooms feature views of the Monumental District, the Claustro de la Fuente (Fountain Cloister) or Convent Gardens. They are all equipped with individualised air conditioning, SAT TV, safe, magnifying mirror, hairdryer, minibar and room service. Access to the swimming pool and jacuzzi, parking and Wifi internet free of charge. Our superior double rooms have views of the Convent Gardens and Monte Pedroso; they also feature a bathroom with natural light, individualised air conditioning, SAT TV, safe, magnifying mirror, hairdryer, minibar and room service. Access to the swimming pool and jacuzzi, parking and Wifi internet free of charge. The Junior Suite with views of San Francisco Street features a king-size bed and living room area. It also includes individualised air conditioning, 32” SAT TV, bathrobes and slippers, safe, magnifying mirror, hairdryer, minibar and room service. Access to the swimming pool and jacuzzi, parking and Wifi internet free of charge. 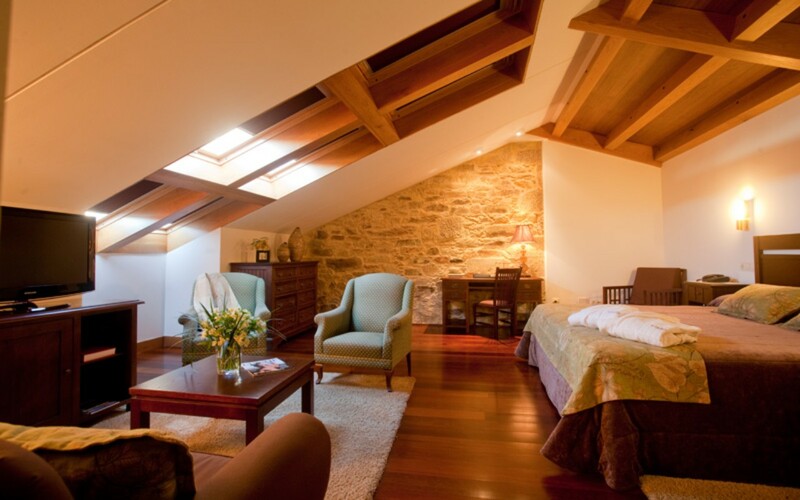 These bright attic rooms, equipped with a small lounge inside the room, feature: individualised air conditioning, 32” SAT TV, bathrobes and slippers, hydro-massage bath, safe, magnifying mirror, hairdryer, minibar and room service. Access to the swimming pool and jacuzzi, parking and Wifi internet free of charge. Santiago de Compostela is the capital of the Autonomous Region of Galicia and was declared a World Heritage City by UNESCO in 1985. It is the destination of the Way of St. James for thousands of pilgrims from all over the world, although an increasing number now continue on to Finisterre. This thousand-year-old route has linked the European continent since the Middle Ages and was therefore declared the First European Cultural Itinerary. Santiago’s historic city centre is one of the most beautiful urban areas in the world, centred on Plaza del Obradoiro. The square’s name refers to the workshop (“obrador”) of the stonemasons that built the Cathedral, which is visited by hundreds of pilgrims every day of the year. The centre of the square is Kilometre Zero of all the Ways of St. James. The Cathedral’s baroque façade overlooking Plaza del Obradoiro is Santiago’s most representative postcard picture. Santiago de Compostela’s international airport (Lavacolla) is 15 km from San Francisco Hotel Monumento, while the train and bus stations are 1 km and 800 m away respectively. Santiago de Compostela is a magical place that is ideal for enjoying a unique experience, while strolling around its streets of stone. There are always secrets to be discovered and reasons for returning. The Gaiás complex occupies an area of 141,800 square metres, the same as Compostela’s historic city centre. Its valuable architecture makes it an international reference point. Peter Eisenman’s project recreates a new summit on Monte Gaiás; it is like a stone shell that is reminiscent of an archaeological site, divided by natural cuts evoking the motif of the scallop, Compostela’s traditional symbol. The warped landscape that arises from superimposing the layout of Santiago’s medieval quarter and the fluted undulations of the pilgrims’ scallop, forms a pleasing expressionist scene that blends effortlessly with the terrain. Strolling around the monumental city and discovering the arcades in the streets Rúa Nova and Rúa del Villar. Visiting one of the more than 12 city museums, such as the Holy Land, Cathedral and Pilgrimage Museums.Do not miss one of the most romantic views of the Cathedral and its surroundings from the walk in Alameda Park. Wandering around the Mercado de Abastos (food market) in the morning. Discovering some of the historic city centre’s secrets, such as the monk whose shadow is projected onto the Cathedral in Plaza de la Quintana every night, as well as the curious and varied gargoyles in different buildings.